International Workers' Day is a big deal for the People's Liberation Big Band. As its current Kickstarter campaign suggests, the collective engages in the "occasional encouragement of class warfare." PLBB demonstrates Sunday, May 1, at the Record Bar. *Pat Metheny and Larry Grenadier will perform at Liberty Hall in Lawrence, Kansas, on September 29. *Hermon Mehari is the subject of a video feature. *Karrin Allyson reveals her Luddite tendencies to a journalist in Pennsylvania. *KCJazzLark continues to recollect his experiences with the Kansas City Jazz Commission. *Topeka Jazz Workshop awards scholarships of $1,000 to $1,500 to five students. *Marilyn Maye will appear at a benefit concert May 1 at Rockhurst High School. *The 2011 version of Jazzoo, the annual benefit for the Kansas City Zoo, features precisely zero jazz acts. *Mark Southerland teams up with the Jacob Fred Jazz Odyssey this weekend for the opening of Jazz Fest in New Orleans. *Gary Foster will appear on Steve Kraske's Up To Date Friday, April 29, on KCUR. 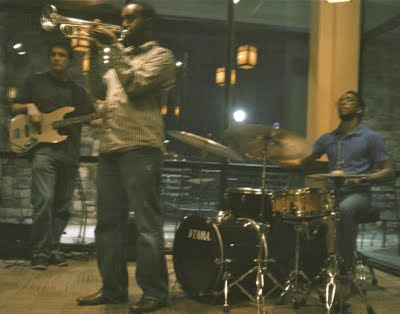 *Tweet o' the Week: marklowreymusic: Jazz and Hiphop from a fun show last November. http://fb.me/IA295pB0. *From Crosstown Station's calendar: Kansas City's best horn player Hermon Mehari is uniting the best of Kansas City's finest Jazz musicians to pay tribute to the great Miles Davis on his Birthday. Guest musicians include Brad Williams (drums), Andy McGhie (tenor saxophone), Andrew Ouellette (piano) Dominique Sanders (bass)... Get ticket now as this will be a sold out show. The show is May 26. *Details on a free May 4 concert by the University of Kansas Jazz Ensembles from Dan Gailey via Lucas Homer: Jazz Ensemble I (directed by Dan Gailey) is performing the following: BJORK: Desired Constellations (arr. James Miley), Army of Me (arr. Travis Sullivan; Travis is the leader of Bjorkestra), Hyperballad (arr. Matt Moresi). RADIOHEAD: Knives Out (arr. Dan Gailey), Kid A (arr. Steve Owen). STEELY DAN: Two Against Nature (arr. Fred Sturm). Jazz Ensemble II (directed by Bob McCurdy) is performing the following: RADIOHEAD: Bodysnatchers (arr. Fred Sturm). STEELY DAN: Home At Last (arr. Fred Sturm)...and an opening tune... Jazz Ensemble III (directed by Greg Battista) is performing the following: RADIOHEAD: You and Whose Army (arr. Steve Sharp--KU student). They are also performing a group improv piece based on themes by Bjork and Radiohead. Additional information is available here. The St. Louis-based record label Maxjazz, long admired for its mainstream jazz releases, continues to issue fine new recordings. One reason for the label's ongoing success is the candor and commitment of owners Richard and Clayton McDonnell. Plastic Sax recently conducted the following email interview with Richard. Plastic Sax: MaxJazz features handsome and consistent artwork. Has the care you put into packaging contributed to the success of the label? Does it play a role in the ratio of physical-to-digital sales? Clayton McDonnell: Our packaging is an important element in the development of MAXJAZZ because we want to establish a brand image in the marketplace. We use black and white photography and feel that the digipak provides a nice canvas for the photos. We’re developing the label by series (vocal, piano, horn, etc. ), and each series has a different design graphically, but still similar enough that it has a familial feel to it. If you’ve had a good experience with one of our releases, you may be more inclined to try another even if you aren’t familiar with the artist, but recognize our packaging. The series approach also appeals to certain customers who want the entire collection. Our digital sales have certainly increased over the last few years and I believe our packaging does plays a role. We’re pretty well established with 70 recordings in the marketplace, and even though you’re limited to just the cover art in a digital format, I think ours is distinctive enough to make a difference. PS: What percentage of your sales are back catalog as opposed to new releases? Physical versus digital? Domestic versus international? CM: About 70% of our sales are new releases. Digital and physical sales are now almost 50-50 in the U.S. About 70% of our sales are domestic, but our international distributors are more inclined to purchase back catalog. Artist sales are also an important outlet and we’re fortunate that a number of artists tour regularly and sell CDs at their gigs. PS: Do you have plans to issue any of your titles on vinyl? CM: We’ve discussed it, but we don’t have any immediate plans to do so. PS: Between Euclid Records, Vintage Vinyl and Webster Records, St. Louis seems to have a strong base of jazz-friendly retailers. Is my perception accurate? Can you recommend an outlet for MaxJazz releases in Kansas City? CM: Yes, your perception is correct. We’re fortunate that St. Louis has three very strong independent retailers. Joe Schwab (Euclid), Tom “Papa” Ray (Vintage) and Jennifer Bellm and her staff at Webster Records are all very knowledgeable when it comes to jazz and its history in St. Louis. I’m almost certain there aren’t any independents in Kansas City that carry our product, and the recent closing of Streetside Records has had an impact on our sales in the area. Our distributor (ADA) ships to a couple independents in Lawrence including Love Garden. A majority of the major retailers, like Borders and Barnes & Noble, still offer our recordings in Kansas City. We’ve had discussions with the American Jazz Museum about selling our releases, but nothing has materialized yet. PS: In terms of sales, what qualifies as a commercially successful mainstream jazz release in 2011? 1,000 sold? 10,000 sold? 25.000 sold? CM: We typically shoot for 4,000 units for an instrumental and 8,000 for a vocal release – CDs and album downloads. If we can hit those numbers, we’ll break even, which is our main objective. PS: What are the advantages and disadvantages of being based in St. Louis rather than Los Angeles, New York, Paris or Tokyo? CM: My father, Richard, and I were born and raised in St. Louis and it seems like a natural home base. St. Louis has a deep musical history, especially when it comes to jazz, and we like the idea of contributing to its rich legacy. We travel to New York frequently because most of our artists are based there and we do most of our recordings there. I think there’s some advantage of having an outside perspective from the New York scene. As much as we like jazz, our lives would likely be consumed by it if we lived in New York (which isn’t a bad thing!). PS: You just released a new album by Terell Stafford. A number of the premiere names in jazz record for MaxJazz. What makes MaxJazz an attractive home to musicians? CM: I believe we’re an artist friendly label because we view it as a long term partnership. Our biggest decision is choosing the artist. After that, we give them complete artistic freedom when it comes to their recording. We also support them as much as possible through our marketing efforts. PS: One of the regular themes at Plastic Sax is the attrition of the jazz audience and the desperate need to develop a new base of younger fans. As owners of a mainstream jazz label, you probably have unique insights into this matter. Is there a typical MaxJazz customer? Are you concerned about the aging demographic? CM: I can’t say we have a typical customer, but we do have an adult consumer base that still likes to buy physical product. The aging demographic concerns us, especially considering more and more physical retailers are closing or cutting back on the amount of acoustic jazz recordings they carry. A portion of our consumer base will continue buying physical product because they want high resolution sound quality, liner notes, photographs, CD-credit information and a number of features not available yet online. We understand the convenience of a digital retailer, and one our challenges is broadening our brand image online through more than just our cover art. PS: What's your assessment of the jazz scene in St. Louis? CM: St. Louis has a very strong jazz scene. There are some good venues presenting local jazz musicians almost every night of the week. From a national perspective, Jazz St. Louis, which books Jazz at the Bistro, brings in top-notch talent. This year I’ve seen performances there by The Bad Plus, Stanley Clarke, Chris Potter and Brad Mehldau for example. There are also some very good performance venues including the Sheldon Concert Hall and the Touhill Performing Arts Center. In fact, Ron Carter’s Golden Striker Trio, featuring two of our artists, Mulgrew Miller and Russell Malone, just performed at the Touhill as part of the Greater St. Louis Jazz Festival. PS: Have you ever considered signing a Kansas City-based jazz artist? What are you impressions of the jazz scene in Kansas City? CM: We haven’t signed any Kansas City-based jazz artists, but we’re certainly fond of artists like Karrin Allyson and Kevin Mahogany, both natives of Kansas City. I haven’t attended any concerts at The Gem or the Folly Theater, but artists of ours who have performed there have had good experiences. Plastic Sax is honored by the opportunity to be the first to announce the 2012 season of "Live at the Hollywood Theater." All events in the prestigious Leavenworth, Kansas, concert series start at 8 p.m. Receptions before each event allow guests to "meet and mingle" with the performers. More information is available at Leavenworth Concert Series. Double bill: The duo of Mike Pagan and Millie Edwards and the Will Matthews Quartet with Reggie Thomas. Double bill: The Makuza Latin Jazz Ensemble and the Toni Gates Ensemble. Two concerts- The Elders on May 14 and Angela Hagenbach on November 17- remain in the 2011 season. I was pleased to see that jazz would serve as the theme for an upcoming Kauffman Center Encore event. But then I learned that music at the party will provided by a DJ who will spin "jazz/swing and modern beats." Criminy! Let's pretend that the guy is looking to slip one Charlie Parker selection into the mix between St. Germain and Diplo. What single selection should he choose to win over curious jazz neophytes? Perhaps it's only because I've always been so enamored with King Pleasure's version, I'd recommend "Parker's Mood." "Yardbird Suite" or "Ornithology" might be too off-putting for ears accustomed to the likes of Bruno Mars and Taylor Swift. *A local jazz blog extols the virtues of the People's Liberation Big Band. *KCJazzLark shares compelling war stories from jazz's trenches. *Nick Rowland is interviewed at the site of the Black House Improvisors' Collective. *A local television station covers an American Jazz Museum fundraising initiative. *Here's a review of Diverse's Michael Jackson tribute at the Record Bar. The Star reviewed recent concerts by The Preservation Hall Jazz Band with Del McCoury, Bela Fleck, Zakir Hussain and Edgar Meyer, Jeff Beck and Terence Blanchard. *Tweet o' the Week: beauzmuzik: Every time I start learning a new song from Guinga, it's like discovering a beautiful garden with little animals and flying babies. *In a stringent bout of spring cleaning, I deleted dozens of defunct and dormant artist links. MySpace accounts without 2011 logins, for instance, have been eliminated. Several of Kansas City's most prominent jazz artists, consequently, are no longer listed in the column to the right. I implore these musicians to rectify the situation- not for Plastic Sax, but for the sakes of their careers and legacies. *From the Kansas City Jazz Orchestra: With a jazz heritage that began decades ago in Leavenworth, KS, has touched nearly 200 movie soundtracks, and added to numerous studio recordings along the way, saxophonist Gary Foster returns to Kansas City on April 29 to join The Kansas City Jazz Orchestra in concert. Dubbed "Big Band Summit: The Master Returns," the limited seating performance is set for 8 p.m. at Unity Temple on the Plaza. *From Brad Cox: The People's Liberation Big Band of Greater Kansas City celebrates International Workers Day, Sunday May 1 with an 8:00 pm performance at the RecordBar. The band will perform excerpts from its score for Battleship Potemkin (with video screening), selections from Threepenny Opera (arranged by Brad Cox and Jeffrey Ruckman) and present a lively musical debate on the subject of intellectual property and copyright law. Cover price at the door is $5. Here's an amusing PLBB plea for funding at Kickstarter. Although I'm accustomed to crazy talk, I did a double take when a friend told me that Rob Scheps (warning- buggy site) was the best saxophonist she'd ever heard. That this plaudit was shared at the intermission of Joe Lovano's recent concert at the Folly Theater made it all the more incredible. Even so, I took notice when Lovano warmly greeted Scheps from the stage that night. I headed to Ron Carlson's weekly gig at Lucky Brewgrille in Mission last Friday to catch Scheps sitting in with the band. Although the setting was far from ideal, I was able to hear enough to know that my friend isn't entirely nuts. Scheps' burly tenor saxophone reminded me of the approach employed by Scott Hamilton. The entire gig, in fact, resembled a refined '80s-era session for Concord Records. It looked and sounded a bit like this Scheps-free footage. I also realize that Scheps isn't limited to mainstream sounds. He plays in an entirely different format here. About two dozen people paid attention to Carlson's band. The remainder of the popular restaurant's patrons chatted noisily as they watched a Royals game on television. I applaud Lucky Brewgrille for its commitment to live jazz and for having the decency to play recorded jazz during the band's break. Even so, it's a compromised situation for serious musicians. The Cobb salad at Lucky Brewgrille, incidentally, is quite good and the service is excellent. Carlson features Stan Kessler on Friday, April 22. With any luck, I'll be there. Rare is the night in Kansas City that doesn't have at least a couple attractive options for jazz fans. The choices on Saturday, April 16, however, represent an embarrassment of riches. Just the "B"s alone are stunning. Guitarist Jeff Beck (his 1975 fusion album Blow by Blow remains a guilty pleasure) appears at the Uptown Theater, banjoist Bela Fleck plays with Zakir Hussain and Edgar Meyer at the Carlsen Center and trumpeter and composer Terence Blanchard performs with his band at the Gem Theater. (Joe Klopus offers a preview of Blanchard's concert.) Take that, New York City! *Three Stories, a new solo piano album by Eldar, was released April 5. *KCJazzLark reports that the Mutual Musicians Foundation continues to pack 'em in. *Michael Pagan and Millie Edwards are throwing a CD release party Thursday, April 14 from 5:30-7:30 p.m. at Jardine's. *Pat Metheny receives lavish praise from The Guardian. The guitarist also announced a tour of "intimate venues" with bassist Larry Grenadier this fall. There's no word on a hometown date in Kansas City. *A blogger shares his notes on a recent Snuff Jazz performance. *Another blogger wrote a mini-review of a recent performance by Roger Wilder's band at the Blue Room. *A French blogger raves about Diverse. *As of 5:35 a.m. April 13, a "$20-buys-$40" Groupon deal for Jardine's was still available. *The Lied Center created a promotional video for Thursday's concert featuring the Preservation Hall Jazz Band and the Del McCoury Band. *Does James Farm, a new jazz supergroup, have a Kansas City-area connection? NPR's Patrick Jarenwattananon speculates. *The locally-based author of Contemporary Jazz laments the elimination of the Contemporary Jazz Grammy Award. *A new post at the blog of the Kansas City Jazz Orchestra promotes an April 29 appearance by Gary Foster. *Tweet o' the Week: KCJazzLark: Folly Theater is tweeting! I've criticized @THEFOLLYTHEATER for ignoring social media & now welcome them. First tweet? Karrin Allyson show. *From Jim Mair: Bands from a three-state area will be descending on Kansas City Kansas Community College for the first Kansas City Jazz Summit April 25-30. For six days – from Monday through Saturday – some of the best young musicians in the Midwest will be performing along with the Kansas City Jazz Orchestra and Jazz Quintet and the Kansas City High School Jazz All-Stars. Twenty-four high school and college bands and two jazz choirs from Oklahoma, Missouri and Kansas will be adjudicated by members of the Kansas City Jazz Orchestra and other leading jazz educators from the Kansas City area Thursday through Saturday. *From Jim Mair: The unbeatable combination of great jazz and great barbecue will be the order of the night for the annual Jazz Cabaret at Kansas City Kansas Community College Thursday, April 28. One of the highlights of the first ever Jazz Summit to be held on the KCKCC campus at 7250 State Avenue, the Cabaret will kick off at 5 p.m. with a “Mocktail Happy Hour” featuring jazz vocalists in the lower level of the Jewell Center. Details are here. *The 2011-12 season of the Performing Arts Series at Johnson County Community College has been announced. It includes Ambrose Akinmusire, one of the most buzzed-about names in jazz. Here's a list of the jazz-related events in the series: 9/30- The Miles Davis Experience featuring the Ambrose Akinmusire Quintet 11/12- Max Weinberg; 12/03 Turtle Island Quartet; 12/16- Burning River Brass Band; 1/21- Poncho Sanchez. The ongoing opportunity to hear Bobby Watson tear it up is one of the best things Kansas City has to offer. No matter the setting, the jazz giant's exuberance is infectious. 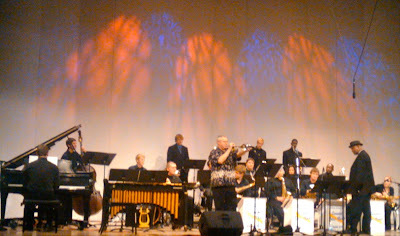 Watson led the UMKC Conservatory Concert Jazz Band Wednesday, April 6, in a performance at White Recital Hall. The concert featured two arrangements commissioned for the event and the compositions and trumpet work of featured guest artist Jack Walrath. About 100 people attended. The concert began with the world premiere of Edward Simon's arrangement of Horace Silver's "Song For My Father." In spite of drummer Ryan Lee's bashing, it seemed a bit creaky. Even the colorful presence of Walrath couldn't keep a few of the subsequent pieces from sounding overly academic. A handful of participants, including saxophonists Blake Deibel and Brett Jackson and excellent bassist Zach Beeson, stood out. And as many already know, drummer Brian Steever is perhaps the most visually entertaining musician on Kansas City's jazz scene. It was disappointing, however, that not every student in the 18-piece ensemble was allowed to solo. The final two selections were easily the most memorable. Walrath's raucous "Sorry Display in a '65 Ford" was in the vein of the wild music made during the trumpeter's stint as a member of Charles Mingus' band. Watson picked up his alto saxophone during the world premiere of Tyler Gilmore's arrangement of "Deep Pockets," a composition from Watson's 2008 From the Heart album. This, my Kansas City jazz friends, is how it's done. Sue Vicory's film aside, I've long lamented the lack of decent video documenting Kansas City's current jazz scene. The embedded clip- raw but professional- captures the essence of the Sir Threadius Mongus aesthetic. Although it looks like a lot of work went into it, the video probably didn't cost much to produce. Recorded at the R Bar on December 16, 2010, the video serves as a teaser for the collective's forthcoming Threads release. Here's the lineup: Russell Thorpe- bass clarinet, Matt Otto- tenor, Patrick Ketter- tenor, Matt Hayes- bass, Annie Ellicott- vocals, Jonathan Taylor- drums and Jeff Davis- guitar and composition. *Norman Brown and Big Bad Voodoo Daddy are among the acts scheduled to perform at this year's Jazz In the Woods festival. *The Kansas City Jazz Summit will be held at Kansas City Kansas Community College and Unity on the Plaza at the end of April. *Steve Paul reviewed Benny Golson's performance at the Blue Room. So did Elgin Smith. *Before Joe Lovano's concert Saturday, a representative of the Folly Theater announced that the following acts have been booked for the venue's 2011-12 jazz series: Nnenna Freelon, John Pizzarelli, the Vanguard Jazz Orchestra and the Yellowjackets. *Chuck Berg raves about Kim Park. *Doug Ramsey provides a troubling report on ailing Basie band alumnus Frank Foster. *Another lesson in Kansas City jazz history is offered by KCJazzLark. *Lawrence's Blueprint Jazz is featured in the University Daily Kansan. *The new album by Clint Ashlock's New Jazz Order is now available at iTunes. *Here's a nice new video feature about Pat Metheny's Orchestrion project. *Performances by Snuff Jazz and the Jacob Fred Jazz Odyssey were reviewed by The Star. *An animated discussion about the merits of KKFI follow a letter from radio station personality Barry Jackson. *Steve Penn provides an update on the health of Ray Reed. *Tweet o' the Week: americanjazzkc: Taxes are never fun, but it's only through the E-tax that the AJM is able to stay open and provide the exhibitions and programming we do. Only about 400 people attended. Empty seats outnumbered patrons. And a significant portion of them, displeased by Lovano's aggressive approach, walked out. The Folly Theater's failure to utilize free promotional tools continues to disappoint me, but the problem is far more complex than that. I was rattled by the reaction I received when I shared my excitement about Lovano's concert with friends during the previous day's First Friday celebration. One owns a record label. Another specializes in music marketing. A third books bands. A fourth works in radio. Not one of them had even heard of Lovano. He may lack the charisma of his frequent collaborator Esperanza Spalding, but within the jazz world, Lovano is a giant. When one of jazz's most important and compelling artists doesn't even register as a blip on the radar of music professionals, jazz is in a world of hurt. It's not the economy or competition from other forms of entertainment. Three rock-oriented concerts- Bright Eyes at the Uptown Theater, Three Days Grace at the Midland Theater and Henry Rollins at the Record Bar- drew capacity audiences the same night as Lovano's appearance. I have to believe that a least a few hundred fans at those events would also be attracted to the adventurous new sounds produced by Lovano. Rollins, for instance, issued a Matthew Shipp album on his 2.13.61 record label. I realize, of course, that I'm preaching to the choir. I spotted several of Plastic Sax's 37 readers at Lovano's concert. Even so, it's come to this- jazz is so far removed from music's mainstream that active consumers of rock and hip hop have virtually no awareness of vital artists like Joe Lovano. I ran into a loyal advocate of Kansas City's jazz scene at Saturday's Joe Lovano concert. Dismayed by the institution's failure to get the word out about a noteworthy event, he encouraged me to make special mention of a forthcoming appearance by trumpeter Jack Walrath at the University of Missouri-Kansas City. The veteran of Charles Mingus' band plays with the UMKC Concert Jazz Band on Wednesday, April 6. A few tantalizing details are hidden here. But don't tell a soul- it's a secret. Jazz giant Benny Golson, the composer of jazz standards "Killer Joe," "Stablemates" and "I Remember Clifford," performs at the Blue Room on Friday, April 1. No fooling.